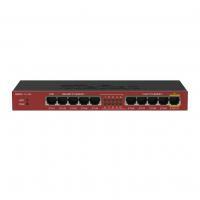 The RB2011 is a low cost multi port device series. Designed for indoor use, and available in many different cases, with a multitude of options. The RB2011iL-IN is the most basic model, with five Gigabit ethernet ports, five Fast ethernet ports, power jack and PoE support. It’s powered by the new Atheros next generation 600MHz 74K MIPS network processor and has 64MB of RAM and a Level4 RouterOS license. There is PoE output function for port #10 - it can power other PoE capable devices with the same voltage as applied to the unit. Maximum load on the port is 500mA. RouterBOARD 2011iL-IN comes with desktop enclosure and power supply. Wall mount kit for network closet is available for purchase as an optional accessory. © 2019 www.wifi-stock.co.uk all rights reserved.